Maze (Lesley-Ann Brandt), Chloe (Lauren German), and Dr. Linda (Rachael Harris) during a night out. Image courtesy of ‘Lucifer’/Netflix. Season 2, Episode 4: “Lady Parts”– This episode is all the about the ladies, and I would be more than happy to watch several more episodes just like this one. 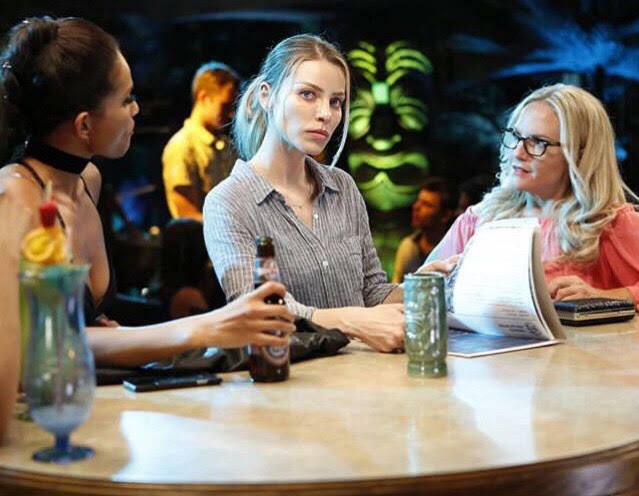 After Lucifer suggests Chloe does not have enough fun, she ends up going out with Maze, Ella, and Dr. Linda for drinks, though initially she is still trying to work the case. As the night wears on, Chloe seems to settle into the swing of things and relax; the women are slowly but surely becoming more and more drunk, opening up to each other, and agreeing to form a blood pact the next time they hang out (naturally). Chloe spots a man across the room, recognizing a stamp on his hand that links back to the case, and she makes a move to approach him. However, the other women think she is trying to flirt with the cute guy next to him, and when the realization sets in that they are wrong, they begin shouting “ABORT!” It seems Ella, Maze, and Dr. Linda are not the only ones believing Chloe is attempting to flirt with the man, because when his girlfriend appears, the entire room devolves into a fight. This leaves Dr. Linda crouched under the bar, confused but supporting her friends in their brawl. All in all, the episode is entertaining and highly relatable, from the seamless start to unusual friendships, to the girls having too much to drink and making attempts at imitating Lucifer’s accent. 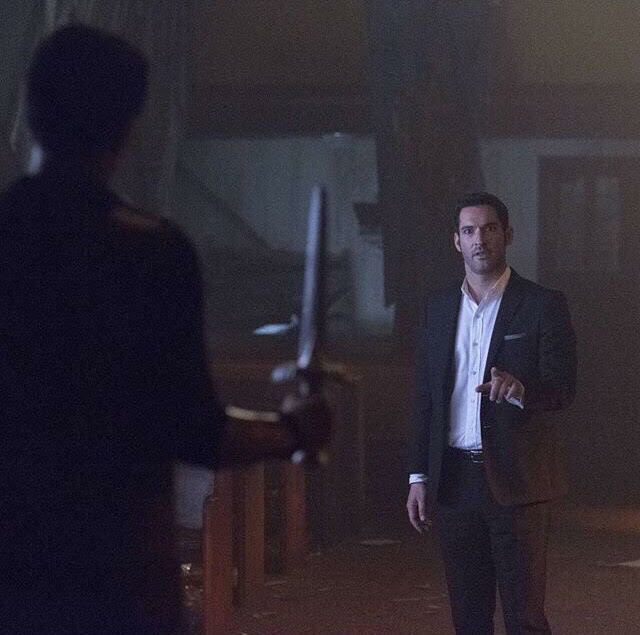 Lucifer (Tom Ellis) squares off with Uriel (Michael Imperioli). Image courtesy of ‘Lucifer’/Netflix. Season 2, Episode 5: “Weaponizer”– In the opening scene, we see how Chloe’s car accident happened — or rather, why it happened. This is our first glimpse at Uriel, and we learn that he plays with patterns: one slight movement of a seemingly innocent object, and the dominoes begin to fall. Lucifer spots his brother while at a crime scene and follows him to a rooftop where he is given an ultimatum: either the Goddess of Creation (a.k.a. Mom) goes back to Hell, or Chloe dies within 24 hours. Amenadiel, who is the brother that God always sent to do his bidding, decides to make an attempt at intimidating his younger brother into leaving Earth. But when Amenadiel does nothing more than talk, Uriel sees through the bluff and is easily able to beat his usually action-oriented brother. In the end, Lucifer makes the decision to not return his mother to Hell, but he is also not going to let Chloe be killed without putting up a fight. Uriel reveals he has stolen the Angel of Death’s blade (that is capable of killing an angel) and has brought it with him. But he refuses to use it on Lucifer, instead opting to fight. Uriel turns his back to Lucifer after throwing him across the room and walks to an old piano, raising his finger to press a key and set in motion the events that will ultimately lead to Chloe’s death. But before he can press the key, Lucifer stabs his brother with the blade. Though Uriel studies patterns, he admits he did not see this particularoutcome and, with his last breath, he whispers something in his brother’s ear that would not be revealed this season for quite some time. 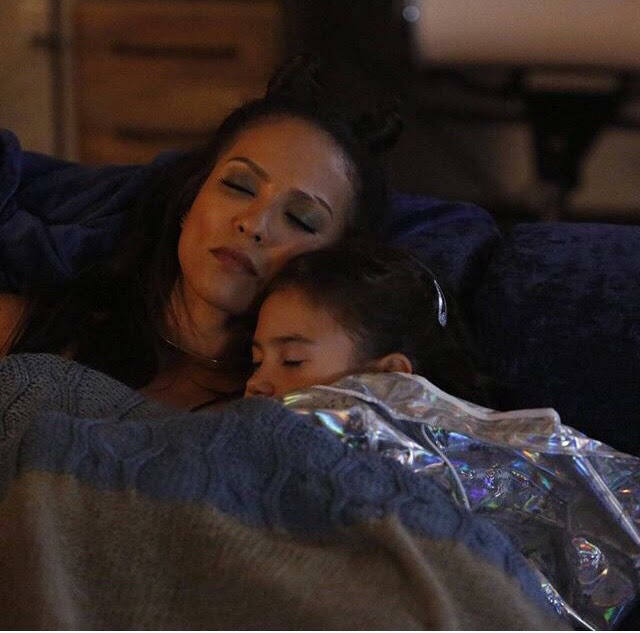 Maze and Trixie (Scarlett Estevez) fast asleep on the couch after a day out. Image courtesy of ‘Lucifer’/Netflix. Season 2, Episode 6: “Monster”– It is Halloween, and Maze has scared off Trixie’s babysitter, so who better to take the young girl trick-or-treating than a demon? If I had Maze to take me out on Halloween when I was a kid, I would have gone out a lot more; she glared at one homeowner for so long, that he not only gave the “President of Mars” extra candy, but he also opened up his wallet to the kid! This episode showed us the bond we didn’t really know we needed to see more of between Maze and Trixie. The cute was capped off when Chloe arrived home that night to find the two asleep on the couch. Regarding Lucifer’s whereabouts this episode, he is still reeling from the guilt of killing Uriel, and he appears to be in a bit of a downward spiral, especially when he repeatedly tells this episode’s bad guy to shoot him. We also finally see Lucifer reveal his Devil face to Dr. Linda, leaving her appropriately shocked. 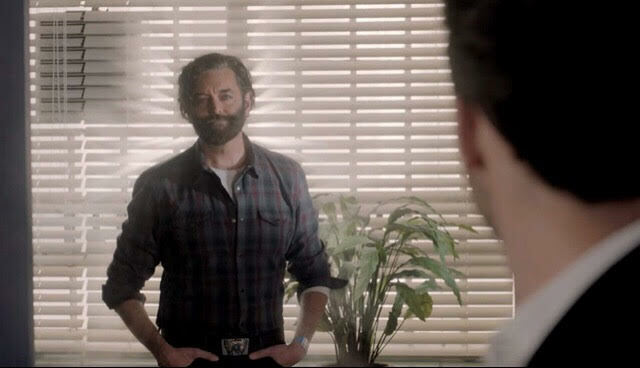 God (Timothy Omundson) makes an appearance. Image courtesy of IMDb.com. Season 2, Episode 16: “God Johnson”– Before I got into watching this show, I had heard about an episode with Timothy Omundson, a favorite actor of mine, so this was definitely one I was looking forward to! A murder case lead Lucifer into the path of a man calling himself “God Johnson,” and we see the script flip: he believes “God” to be faking and treats him as though he is, the same way we have seen everyone else treat Lucifer when first meeting him. As Lucifer is walking out the room, God says, “It was real good seeing you, Samael,” despite Lucifer never introducing himself. Lucifer wields the flaming sword. Image courtesy of ‘Lucifer’/Netflix. Season 2, Episode 18: “The Good, The Bad, and The Crispy”– The season two finale brought Charlotte Richards as the Goddess of Creation to its peak and ultimate end. We had seen her human body begin to fail, and her urgency to get the remaining piece of the flaming sword had begun to take its toll on her relationships, rocky as they may have already been. When Chloe was assigned the case of the murdered Chet Ruiz (introduced in a previous episode and killed by Charlotte), Lucifer tries and fails to throw her off track. In a desperate attempt to get to the bottom of a statement Dr. Linda had given about Lucifer, Charlotte severely injures Linda, leaving her to die. 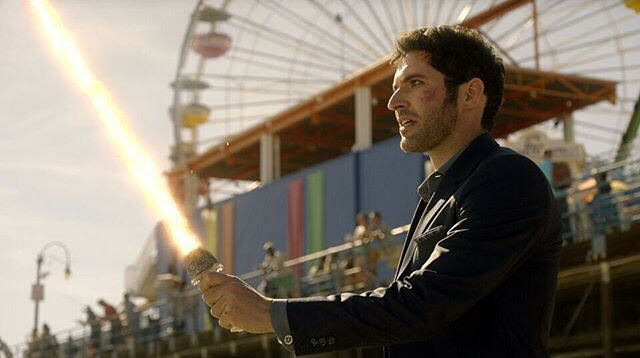 We later find Charlotte at the Santa Monica pier, confronted initially by Chloe and Dan, then by Lucifer with the remaining piece of the sword, and finally by Chet’s older brother Hector wielding a handgun. Despite Chloe’s attempts to talk him down, a shot rings out and the fate of everyone on the pier seems bleak, when time suddenly slows the way it did in season one when Amenadiel still possessed his angelic powers. Amenadiel had regained his powers and was using them to slow time to give Maze a chance to get Linda the help she needed, which ultimately helped Lucifer as well. Back on the pier, Lucifer tackles his mother and they land in the sand below, with Lucifer holding and activating the flaming sword. Lucifer swings the sword downward, appearing to be aiming for his mother, but instead slashing a rift to another, empty world where she would live alone and could create a new life.